These were on my car as new. Just replaced them and they are good tires. These people complaining about performance must drive really hard. My old ones had 36,000 on them and still had enough tread to keep them as spares. These tires came on my 2014 Silverado and are being replaced very soon. 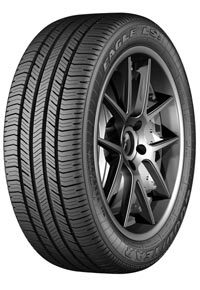 The good: They are great driving tires, nice and quiet on the freeway and handle very nice in corners. The bad: On my truck they have not been so great in the wet and spin very easily, in the snow they are downright scary. Almost zero traction and 4WD was a must on even the smallest dusting. Tread life has not been great either, under 30k and they are junk, wont pass inspection when I get one in a few weeks. Terrible tires, came on truck as original tires. I don't drive hard and have had one set dry rot (and the truck is driven everyday). They wear out fast! I'm on my sixth set of tires and my truck only has 90,000 miles. I do not recommend them at all and am switching to another tire today. I would not buy this tire ever again. I have had two of these get dry rot. Wish I didn't have to buy a high performance tire. The tires were original equipment when the truck was purchased new. I got 45,000 miles out of them and still had 4/32 tread life remaining. I purchased them again and will continue purchasing them until my truck is replaced. Very happy with Goodyear tires. No mileage warranty and wear extremely fast. It was the only tire I could find for my Jeep Patriot and I only have 56000 on my Jeep and I am on my 3rd set. Horrible wear life and would not recommend, obviously why they do not give you a mileage warranty with the tire, GARBAGE and at the price it is ridiculous you cant even get 20000 miles out of them! These tires are soft and they handle well in dry conditions. But when roads are wet and or snow covered, they don't do well. I would not buy these if you plan on driving in the snow. Very smooth, long lasting tires. Solid performance and great traction in the snow with 4x4. These are the original tires and have over 65,000 miles on them. Now starting to look to replace them because the tread is starting to get thin. Will probably buy the same ones again. Great tire from the factory. Tire does not have a 50,000 mile warranty for some reason. I have 54,000 miles on my tires and haven't reached the wear mark yet. Currently looking for good prices to replace them. Not rated for snow because it didn't snow in Florida since I bought this truck. Tire slips in rain when worn to the point where I'm at. The reason for looking for new tires. These tires are great! I would definitely recommend them for all-around safety and driving ease. Great tires. I have put about 50,000 miles on this set and am about to buy another because they were not rotated and my alignment is off and has worn the inside of the tire down and cause a rough ride. My fault for not checking. But about to buy another set. Also, a great value. Amazing tire for the price! Definitely helped my car (and me) get around in the Wyoming weather more efficiently and safely. I no longer had to speed out of my drive way to get up the hill!